The spring is a time of year that we celebrate the fresh warm weather. It is the start of the seasons that bring people outdoors more. It also brings Easter celebrations. Kids love to celebrate Easter for several reasons. One of course is the fact that they will be getting a basket that is usually filled with goodies. Candy beans, chocolate and more makes for a great day. The other aspect of Easter is the tradition of dyeing eggs. The egg dyeing process is something that can be a real mess. Parents are setting bowls of dye on a table and giving access to children. The eggs are hard boiled and laid out so the kids can cover them in the dying liquid. After the eggs are completed the tradition is that they are hidden by the Easter bunny so the kids can run around and find them. The dyeing process is really where you might run into some trouble. Kids are not always careful and they tend to drip and spill the dye on the ground. This is why you want to use some preventative methods as well as know how to treat the stain. How to Prevent Easter Egg Carpet Stains: The first thing is to really come up with some ways to prevent the dye from being spilled on the carpet. One way to do that is to have a tarp laid down under the table before you place any of the bowls of dye. The tarp will hold any dye that has spilled so that you can easily wipe it up with a towel. You can also use towels on the table so that they are a way to absorb any spills or drips that come off the eggs. That way it will not roll off the table and onto the carpet. Use Cold Water & Dish Soap to Remove Carpet Dye Stains: If you happen to still get the Easter egg dye on your carpet you want to make sure that you get cleaning right away. The first method that you can use is very simple and is dish soap and cold water. Warm water will start to set in the stain while the cold water will help you clean the stain. You want to use dish soap to start the cleaning process. Put soap on the spot and let it set for a few minutes. Then you can use clean wash cloth and dip it in a bowl of cold water. Use the cloth to dab at the spot which will pull the color from the carpet. You will need to rinse the cloth off and repeat until the stain is gone. Use Ammonia to Clean the Dye Spill on Carpet: If the soap and water method has not done the trick you may need to use ammonia to clean the stain. Use a cup of water and mix in a teaspoon of ammonia. You can use the mix on a wash cloth and press it into the spot. Then dab with a clean cloth to pull it back away from the carpet fibers. This method should counteract the dye and allow you to remove it from your carpet. Go Green Carpet Cleaning & Restoration offers carpet cleaning as well as stain removal. Give our office a call to have your carpets clean today. Many people choose to do dye jobs on hair for variety of reasons. Whether it is lack of time, finances, or simply you believe you do it better than a professional, doing the dye job in the comfort of your home suits you best. Unfortunately, it is common that hair color gets on more places than just your head. When the hair dye lands on the tile or countertops, it can be easily wiped clean, however, when it lands on the carpet, there is a little bit more involved and we at Go Green Carpet Cleaning & Restoration would like to share it. 1) Use a spoon or dull edge to scrape the glop up, being gentle to not push more dye into the carpet and smear it off on the paper towel. 2) Blot with paper towels with gently pressure, just enough to lift the surface residues. Don’t mash the dye into carpet. 3) Combine 2 cups of warm water, do not use hot, 1 TBS liquid dish soap and 1 TBS white vinegar in a spray bottle or pale and mix well. 4) Use a cloth treated with a mixture to blot the stain. In between applications blot with a dry cloth to keep the moisture under control as you do not want to over saturate the area. 5) Repeat until the stain fades away. 6) Once the stain is near gone, use clean water to dampen a cloth to blot and rinse the solution away. 7) Dry the area by blotting the moisture with dry towel. 8) Apply rubbing alcohol to a cotton swab and continue blotting what is left of the hair color. 9) Rinse with clean water damp cloth and blot the alcohol residue clean. If the stain persists, move on to the steps below, if not, dry the areas as best you can with a towel. 10) Combine 2 cups of warm water1 TSP of liquid dish soap, and 1 TBS ammonia in a squirt bottle. 11) Lightly mist the remaining stain. Allow the mixture to sit for 30 minutes, but return every 5 minutes or so to blot with a dry cloth. 12) Use a damp cloth with clean water and pat the area. 13) If the stain remains, you can mist hydrogen peroxide and leave it over night and rinse well. Keep in mind hydrogen peroxide could lighten the carpet as well so use caution. Warning: Before you use any DIY remedy or carpet cleaner, be sure to perform a patch test in an inconspicuous area to ensure it does not lighten or compromise the carpet. If the stain remains, call in the professional of Go Green Carpet Cleaning & Restoration and our experts can assess the dye and find the best solution to remove the stain. With the effective and proven products and state-of-the-art equipment, our technicians can extract the stains and remove them quickly. In addition to the stains, the dirt and odors and are also removed, leaving your carpets clean and fresh. Call us today!. When it comes to the floors in your home most people know that there are chores that need to be done to keep them looking their best. The same goes for the rest of the home. You need to clean the house on a regular basis to keep it clean and livable. When you want to keep your home clean it is important to know the best way to do it. There are several types of flooring that might be in the house from hardwood floors all the way to carpet. They each need to be cleaned in a particular way. If you don’t take care of them properly you will have to replace the carpets and other floors prematurely. That is why knowing the best way to clean them is a great way to extend the life of the floors. When it comes to carpet you need to make sure that you vacuum them often to remove the dirt and debris. You also need to know the best way to clean certain types of stains that might occur. One of the stains that you need to know how to clean happens to be blood. This is a stain that if it is not treated properly will set in the carpet and become hard to get out. How Did Blood Get On Your Carpet? : There are several ways that blood can end up on your floors. If you have ever stepped on an object that has cut the bottom of your foot you know that the blood is sure to get on the floor as you find a place to clean up your foot. The other way that blood can get on the carpet is if you end up with a bloody nose. If you don’t have a tissue within arm’s reach your bloody nose can run and get on the floor as you rush to the bathroom for a tissue. If your nose has dripped on the carpet you need to know what to do to get it off the carpet. Start Rinsing Carpet With Cold Water: You want to make sure that if you are working with blood that has gotten on your carpet you use the right method. This means that you want to remove what you can with a cloth and dabbing to get rid of some of the excess. Then you need to use water to soak the space. Be sure that you use only cold water when working with blood. If you use warm water it will help to set the stain rather than remove it. Use your cold water on a cloth that you soak the area with. You can repeat the process a few times to get the majority of the blood off the spot. 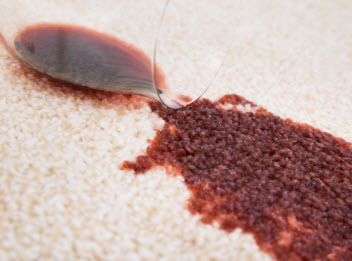 Use Peroxide to Treat Blood Stains on Carpet: You then need to follow up with a product that can react to the blood and help to pull it from the carpet fibers. You can use hydrogen peroxide that you apply to a rag then onto the area. This will cause the blood to start to bubble up and pull away from the carpet fibers. This will help you dab at the spot with a cloth and remove the blood spot. Go Green Carpet Cleaning offers expert cleaning and restoration services. Contact us to schedule a spring floor or upholstery cleaning appointment today! Having hardwood floor in your home is a practical accessory that can really make the home look glorious. Considered an upgrade, hardwood floors increase the home’s value, the beauty can be incorporated into any room and with the versatility of different colors and styles, and it can match any existing interior design. But with any floor option, there is care and maintenance involved to ensure it is kept in agreeable condition, looks amazing, and can last until its projected lifespan or longer and the wood floor is no different. We at Go Green Carpet Cleaning & Restoration would like to relate the basic care and maintenance to ensure your wood floors lasts. Preventive Steps: Moisture and abrasive materials are the primary dangers to your wood floors. Avoiding the elements that can ruin your wood floors is crucial and it is just as important as the routine maintenance you provide. 1) The sun can do its part in dropping the quality of the wood floors. Direct sunlight can fade the finish and cause the wood floor to dry out. Utilize UV treatment film on the windows or at the very least keep the blinds, curtains, or drapes closed during the peak sunlight lights hours to preserve your wood floors. 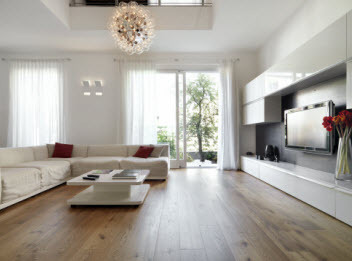 2) The wood floor can be damaged by shrinkage that occurs in humid conditions, avoid it by maintaining the home’s humidity levels between 35% and 55%. 4) Pets could also contribute to so minor issues that can evolve to major problems. Bringing in excessive dirt and debris and long nail can scratch the surface. Do you and your pet a favor and keep them groomed and nails trimmed. 5) To offer your floor more protection from the pets, the sun, and the abrasive soil as well as the detrimental moisture, utilize walk-off mats at all the entry points and place area rugs and runners in the high traffic areas. Be sure to vacuum them daily and vacuum the back of them as well and don’t forget to clean the wood floor under them as well. 6) Moisture of any kind is not wood floor-friendly. Any moisture substance that makes contact with the floor should be immediately dried with a microfiber clot. Even short-term exposure can cause damage. Daily Hardwood Floor Maintenance: Daily maintenance is essential to ensure your hardwood floors keep its shine and beauty as well as overall condition and longevity. 1) Use a clean damp microfiber cloth from only water and wipe away the mess if any spots or sticky residues wind up on the floors and quickly dry the area with a dry microfiber cloth. 2) Exclusively use cleaners and aids that are specific to the type of wood floor and finish you have, when you need to rejuvenate the floor or clean more serious buildup. 3) Soil, food crumbs, and other particles accumulate daily and these are abrasive to floor. Resulting in wear to the finish and increasing the scuffs and scratches, the abrasive particles mixed with the friction created by walking traffic is a problem, especially if it gets out of hand. Use a dust mop, soft-bristle broom, or a vacuum designed for hard surfaces or the option for the bare floor setting to remove the filth off the floor on a daily basis. If you are looking to install wood flooring or simply need a professional wood floor refinish service, call in the professionals of Go Green Carpet Cleaning & Restoration and let our experts get your project done!